This is a resource for filmmakers who want to become entrepreneurs. Because there is a movement of motivated individuals who are building amazing lifestyles utilizing the techniques of successful online entrepreneurs. The goal of Film Trooper is to take those techniques and combine that with resource filmmaking. This is a concept of making films only with the available resources in front of you. You will write a screenplay based solely on the resources in front of you. You learn to make a film product for practically nothing in order to set yourself up for maximum profits when you start selling it online. WHO IS THE IDEAL FILM TROOPER? 1. A newbie filmmaker who is open to learning a new way of making a living as a filmmaker. 2. A filmmaker who has made one or more films ... and who desperately wants to make a sustainable living making more films. WHO IS NOT IDEAL FOR FILM TROOPER? Someone who desires to be a hired hand ... going from one gig to another ... then Film Trooper may not be for you. But if you have a desire to be independent and build a business system that allows you to make more films ... then Film Trooper may be perfect for you! "We don't make movies to make money. We make money to make more movies." WHAT KIND OF RESOURCES DOES FILM TROOPER OFFER? A book entitled, "How to Make and Sell Your Film Online and Survive the Hollywood Implosion While Doing It." But the best case scenario is that you will learn the basic skills of building an online business. So, you can apply that training to other online business ventures if you chose to do so. Either way, it's a win-win for you! And you learn the skills to build more online businesses. In order to get the most out of Film Trooper, all you have to do is sign up to get the FREE GIFT. 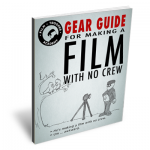 It is a FREE GEAR GUIDE of all the equipment that was used to make a feature film (not a short film) that was made for $500 ... and made with no crew. Yes ... it can be done. As you will thrive as a truly independent filmmaker. And become a Film Trooper today!